For any organization, small or large, data is one of the most valuable assets. Therefore, it needs to be protected against hardware failures. Out of all the components of a Computer, the power supply and the hard drive are more prone to failures. Due to excessive heat generated in the power supply, electronic components within the power supply unit are prone to failure. The solution for this problem is to have redundant power supply units in the Server. In case one unit fails, the other continues the normal operation of the Server. The Hot-Plug power supply units can be swapped without turning the power off, and thus, without interrupting the Server and network operation. The hard drive is the only computer component that contains continuously moving parts. The drive motor continuously rotates at speeds up to 15,000 r.p.m. (revolutions per minute). The wear & tear of moving parts, along with the generated heat make the hard drive prone to failure. Since the data is stored on the hard drive, it becomes a basic necessity to protect data against hard drive failures. The RAID (Random Array of Independent Drives) technology has evolved and become the industry standard to store data and provide protection against hard drive failures. This technology is based on the simple principle of redundancy. Data is simultaneously written on more than one hard drives. If one drive fails, the data is still available on the second drive. This simple form of RAID is called Mirroring. Many advanced techniques have been developed to improve the efficiency and performance under different types of data storage and retrieval requirements. RAID Level 1, also known as mirroring, the same data is stored on more than one drives simultaneously, providing real-time backup. RAID Level 0+1 provides advantages of both stripping and mirroring. RAID Level 3 uses byte-level stripping and parity. In case of a drive failure, data can be recovered from the parity information stored on a separate drive. Level 3 is optimal for applications that transfer large data blocks with each I/O request, with low request rates. RAID Level 5 is similar to level 3, but it distributes the parity among different drives. It is optimal for small data requests with high request rates. Dynamic Parity RAID (Compaq StorageWorks parity RAID option) dynamically adjusts its algorithms, adapting between I/O-intensive applications and data-transfer-intensive applications to provide excellent, across-the-board, parity-based RAID performance. Whether you are a small business, or a fortune 500 Corporation, providing security for your organization’s data is one of your primary needs. Loosing business data due to a hard drive failure, a virus, or a hacker breaking-in to your company’s private networkwould be a catastrophe. The financial losses due to such failures would be beyond imagination. MDEC specializes in providing the Data Security Solutions for your organization. Our technical consultants will evaluate your present and future data storage & data security needs, and custom-design a modular RAID Storage system, which will grow along with your organization. Combining the RAID storage with a custom-configured Symantec Firewall & Antivirus software, provides a complete Data Security Solution for your organization’s network. MDEC RAID & Symantec Software……….TheSecure Data Storage Solution! MDEC offers RAID Storage Systems from 20GB (for a small business) to custom-built Multi-Terabyte Data Centers. MDEC RAID Storage offers the reliability, availability, scalability and performancethat would give you a complete sense of security and peace of mind. Above all, our systems are designed to provide investment protection and the best price/performance for every MDEC RAID model in its price range. MDEC engineers carefully select the most reliable components made by reputable manufacturers like Adaptec, Seagate, Fujitsu, Hitachi and IBM. The hard drives selected for MDEC RAID systems have up to 1 million hours M.T.B.F. rating (Mean Time Between Failures, the yard-stick of reliability), and come with up to 5 year warranty. Dual-redundant power supplies, controllers and fans further enhance the reliability, along with increasing the life of the MDEC RAID system. Each family of MDEC RAID system (Valueline, Workgroup, Department or Enterprise) is designed for expandability to meet your future growth needs. 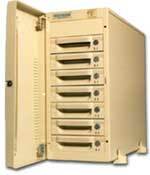 Modular RAID system is easy to service/expand in the field, simply by adding hot-swappable components. Custom-configurations with Fiber-Channel interface are capable of addressing up to 500 drives/controller, giving you ample room to expand, and thus protecting your initial investment. All models of MDEC RAID storage are designed with redundant hot-swappable controllers, hard drives, power supplies and cooling fans. The AlphaRaid family supports True64 UNIX/TrueCluster software by HP and Linux Advanced Server/Cluster Manager software by Red Hat. The ProRaid family supports Linux Advanced Server/Cluster Manager and Windows NT/2000 & Wolfpack Cluster software by Microsoft. A Cluster system of hot-swappable redundant Servers, RAID controllers with automatic fail-over and rolling-upgrade capabilities, redundant power supplies and hard drives mean almost 100% availability, with no down-time. The performance of any RAID system depends on the RAID controller and the hard drives. MDEC engineers thoroughly evaluate these components made by the global manufacturers (like Adaptec, Qlogic, IBM, Seagate, Fujitsu and Hitachi), and carefully select them to provide the highest performance for each RAID family. Because of lower overhead costs, MDEC is able to offer the bestprice/performance for every model in its price-range. The industry-leading Global Array Manager (GAM) software, as well as Cluster Manager for Linux, allows you to remotely configure and monitor MDEC RAID systems, over the LAN, WAN and across the internet. Event notification can be via e-mail, fax or pager. The Graphical User Interface (GUI) makes the management function very easy to use.